400m winners Georgia Price (left) and Nichola Gibson. 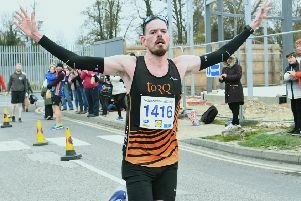 Peterborough Athletic Club rounded off their Southern League season in superb style at St Ives on Saturday. They compiled a massive 119 points to win the Division Three North match with their ladies totally dominating the track events. Hannah Chapman won two races. They won every single race - A and B string - clocking several personal best (PB) times in the process. Leading the way with a ‘double double’ were distance duo Sarah Caskey and Hannah Chapman, who gained maximum points in boith the 1500m and 3,000m. Georgie Ives-Lappin won two hurdles races. Those celebrating lifetime bests were Fenton-Lake in the 100m (12.7) - an improvement of 0.6 seconds, Dixon Walker in the 200m (27.8) - an improvement of 1.2 seconds; Price in the 400m (67.3); Chapman in the 3,000m (11:45.6); and Ives-Lappin in the 100m hurdles (18.4). Several of the track winners also won field events as well. Fletcher went on to complete her hat-trick with wins in the B string triple jump and pole vault - the latter with a PB of 1.75m; Fenton-Lake won the A string high jump with 1.60m; and Whitton the B string high jump with 1.50m. Elsewhere in the field events, Holly Brown soared to victory in the A string pole vault with 2.80m and threw a PB of 7.66m in the shot while Charlotte Hilton came second in the A string hammer and B string discus. Although the men were a little depleted they still impressed with Luke Phillips winning the A string 400m and high jump. In one of the most exciting races of the day, Phil Martin stormed to victory in the A string 1500m and also led from gun to tape in the 5,000m. There was a PB of 11.7 in the 100m for Nathaniel Amaoade and for Zac Treeweek in the 800m with 2:12.0. Adam Jackson added two metres to his season’s best in the hammer with 35.97m. Ian McLoughlin achieved a season’s best in the 100m as did veteran Karl Eve in the pole vault with a clearance of 2.70m. Benji Davies finished 2nd in the A string 800m. Team manager Nichola Gibson described the match as one she will never forget.